I don’t know about you, but when I think of other countries, I’m often more interested in what a typical street from that country looks like instead of the famous monuments and landmarks. I think it gives you good information of what everyday life in this country is like. And I realize that I rarely see pictures of “typical” French streets on the web. 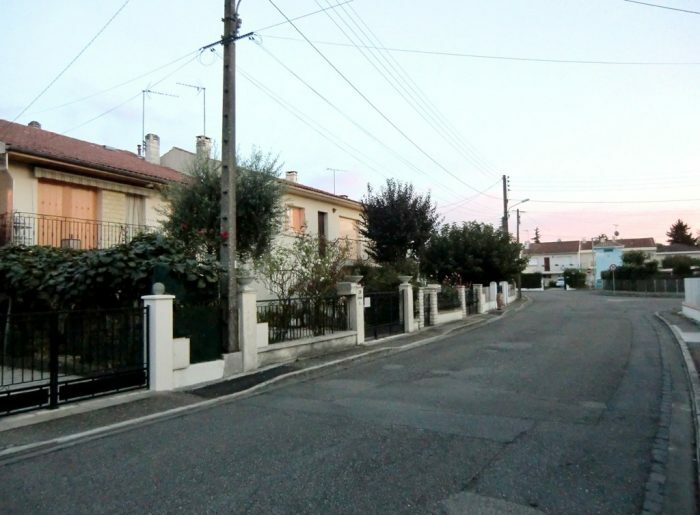 This is basically what a typical French street looks like, or at least a street in a residential area in the French South West, as regional differences do exist. What do you think? Anything that catches your attention more than any other? Does it look very different from typical streets in your own country? i couldn’t find a big difference from our country’s one. There is also electric cable and concrete pavement. – We have lower walls (but an extra grid or hedge). – In some Japanese streets there aren’t any sidewalks. However, French streets are pretty different from English streets (where front yards are rare) or American streets (most of them they don’t have walls, grids or hedges in front of the house). You know a lot about town as though you have learned city planning. What you said is right. One of the most important things is how to separate between cars and pedestrians. In Japan, the street is so narrow that the government can’t prepare sidewalks in some area. The narrow street is dangerous for fire disaster and evacuation route. Actually, I love the way house fronts tell a lot about how we separate private from public life from country to country. In Japan, there’s a big wall between both, and there’s also a big wall in between the front yard and the street. In France, there’s a clear separation between private and public life, but it’s a somewhat porous one, and our fronts are the same, closed but not completely closed. In the US, the line between private and public life is very blurred, as well as the limit between the private and public property in front of a house.